Since September 22, Kopernik has been working with IDEP, Bumi Sehat, Bali ZEN, Rucina Ballinger, Rio Helmi and the Green School parents in a consortium known as Mount Agung Relief to deliver critical supplies to thousands of people who have been evacuated due to Mount Agung’s increased volcanic activity. The Mount Agung Relief effort has raised $79,240 as of October 23. These funds have enabled us to deliver 36 truckloads of much needed items such as hygiene kits, food, blankets, sleeping mats, tarpaulins, and other supplies to 20 evacuation centres in Bangli, Buleleng, Karangasem and Tabanan regencies. Together with evacuee and host communities, we have also built 26 toilets in three evacuation centres and provided education on hygiene, sanitation and community-based risk reduction. We would like to say a huge thank you to all the donors who have supported the relief effort so far. Over 139,000 people are still living in evacuation centres, according to latest government data. Evacuees have now spent four weeks in temporary accommodation, without any indication of when, or if, an eruption will take place. Keeping our commitment to support their needs, we are now moving towards a more sustained role focusing on water, sanitation and hygiene, face mask distribution, and community awareness on disaster preparedness. Comms and Education Kits on Disaster Preparedness. Donations and distributions of food and other evacuation center supplies will continue to be accepted at Agung Siaga, IDEP, BaliZEN and Bali Surf Outlet. As we continue working to deliver necessary support to the evacuees, we invite you to follow the stories of the joint relief effort on the Mount Agung Relief Facebook page. 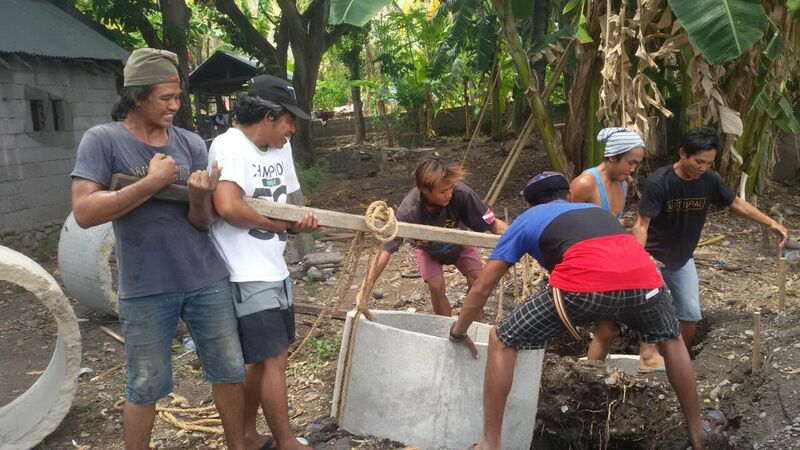 A team led by community leader Komang Bajing built 3 toilets in Amed, supported by Mt Agung Relief.